Mercedes-Benz LED Logo: Bigger, Better, Brighter? Looking for a way to spice up your Mercedes-Benz? (And if you are, you just might officially be the world’s biggest show boater, but hey, you drive a Mercedes. Who cares?) If indeed you are in the market for something bright and flashy to show off your MB (and if you don’t mind throwing down $550 for it), then consider the automaker’s newest LED technology, the three-point grille star that can—wait for it—light up. This flashy addition hits the market next month on new Mercedes vehicles, but never fear, all you drivers who already own a Benz but still inexplicably want your cars to sparkle like mating fireflies: these expensive (but necessary?) lights can be retrofitted to certain past models. 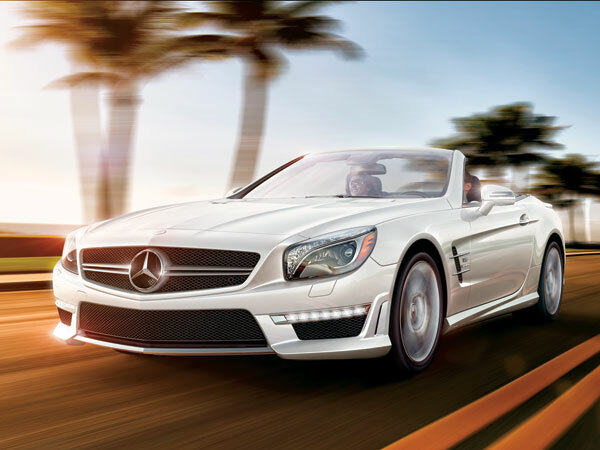 Imagine a glowing logo on the front of this 2013 Mercedes-Benz SL. Don’t get too bright with excitement, however, because there is a catch. It’s, uh, not entirely legal to have bright, shining logos adorning your car—while in motion. That’s why the Mercedes-Benz LED logo can only glow when the car is parked, and even then, only for a limited time. The star will grab attention for just 40 seconds when the car is unlocked, and then only 5 seconds more if a door is ajar. And it’ll be lights out for the logo as soon as the Mercedes is started. We have a feeling, however, that particular crafty (and super loaded) tech gurus will find a way to cheat the system and get their logos to stay alit at all times. If this describes you, just be sure to watch out—the U.S. lighting regulations officers will be hot on your tail, and, honestly, with a logo-glowing Mercedes-Benz, you won’t be that hard to miss.